Expanding where people can carry guns and how — concealed or open — has become a controversial issue between gun owners and groups attempting to put limits on their rights. Pro-gun activists argue that having people carry arms would better protect them from potential shootings, while others cite research showing more guns would lead to more violence. The NRA is currently pressing Congress to pass legislation which would allow people to carry their concealed weapons across state lines. The group is counting on the support of 53 Senate Republicans — including a number of presidential candidates. 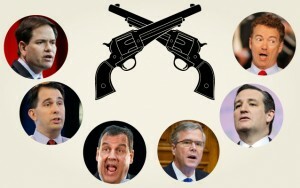 And the candidates are just as eager for the NRA’s support. The NRA spent $18.6 million on the 2012 election, an amount that dwarfs that of any gun control group. Not being on the receiving end could substantially hurt a candidate’s chances.